It’s no secret that master limited partnerships are a great way to bolster your investment income. Designed as pass-through entities, MLPs send much of their cash flows back to investors in the form of large tax deferred distributions (similar to dividends). These distributions often range in the mid-single digits, though some can push into double digits. The problem is since most MLPs are high-yielding by design, we get tempted by those large numbers and forget how important a reliable distribution is. After all … what good is high yield if it’s not around when you need it? That’s where an MLP’s coverage ratio comes in. A coverage ratio is a measure of the amount of actual cash distributions an MLP makes, relative to the amount it could potentially pay out. A coverage ratio of 1 means it’s paying out exactly what it brings in. Less than 1, and the MLP is actually spending too much on distributions. Many institutional MLP investors and analysts view coverage ratios north of 1.3 as favorable — an indication that the firm has ample cash flows to continue paying distributions to shareholders. For retail investors looking for solid MLPs, you’ll want to stick to partnerships that have high coverage ratios indicating that the yield will stick around and even potentially grow over time. Spun off from refiner Marathon Petroleum (MPC) back in 2012, MPLX (MPLX) is quickly becoming a must-own MLP. MPLX controls nearly 2,900 miles of crude oil and finished petroleum product pipelines as well as four storage tank farms and an export/import dock. These assets primarily feed MPC’s own refiners and energy trading facilities, and as such, MPLX gets steady cash flows from its parent for operating the pipelines. The kicker: MPLX is adding to that steady mold. The MLP recently snagged rival MarkWest Energy Partners LP (MWE) in a merger of equals that will create one of the largest MLPs in North America and will allow MPLX to become the largest natural gas processor and fractionator in the Marcellus and Utica shales. The deal — along with new pipeline projects — will help MPLX boost its distribution by 29% this year and achieve an annual compound distribution growth rate of 25% through 2017. And given that MPLX is comfortably earning its distribution now, with a coverage ratio of 1.5, it should have no problem delivering on that promise. For many energy producers, arriving early into a field means that they need to set up their own midstream infrastructure to get their production to market. As one of the first to arrive in the Marcellus, EQT Corporation (EQT) did just that. To raise cash and take advantage of the tax savings, EQT spun off some of the midstream assets into EQT Midstream (EQM). 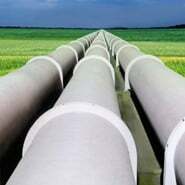 EQM currently owns and operates 700 miles of interstate pipelines as well as 1,600 miles of gathering lines. The beauty is that the bulk of these pipelines and gathering systems are used almost exclusively by EQT’s operations and have cash flows that run like clockwork. That helps explain EQM’s amazing 2x coverage ratio. But there still is room to grow both that coverage ratio and its distributions. EQT still has a total of 8,200 miles of gathering lines and other pipelines used by it and other independent third parties tucked away inside itself. Those pipelines can and will be dropped down into EQM at some point. That creates plenty of instantly accretive cash flows. Since its IPO late last year, things haven’t been going so great for Cone Midstream Partners LP (CNNX), as shares have slumped 45%. However, the recent downturn might not be totally justified. However, Consol Energy has struggled of late. Its main products — coal and natural gas — have sunk hard, putting pressure on CNX’s financials. Still, Consol isn’t facing the same sort of bankruptcy risks that other coal firms are, and it’s getting improved natural gas production from its acreage. As such, CNNX has continued to grow and recently reported a bang-up quarter. That quarter helped drive up its coverage ratio to 1.67%, so its hefty 6.7% yield still looks safe for now. Unlike most refiners, Calumet Specialty Products Partners LP (CLMT) doesn’t just make gasoline and jet fuel. CLMT’s bread ‘n’ butter is producing refined products such as naphthenic and paraffinic oils, petroleum waxes and hydrocarbon gels — basically, all the base ingredients used in a variety of industrial applications as well consumer products. Calumet is thus in a unique position among its peers, though it has faced a couple of issues over the past few years. One was high oil prices, which increases Calumet’s costs and reduces its margins. The other was a relatively high debt load, as CLMT has been a serial acquirer. Back in 2013, when oil really began to surge, CLMT’s management locked its distribution at the MLP to 68.5 cents per quarter to save money and pay off its debts. Still, that 68.5 cents still translates into a juicy yield above 10%, and with Calumet’s margins rising, the MLP might have enough leeway to finally uncap the distribution. Unlike most midstream MLPs, Global Partners LP (GLP) doesn’t actually own pipelines — it owns terminals and storage assets. Plenty of them. In fact, GLP owns one of the largest networks of these assets in the country, and its reach covers the full range of petroleum product — heating oil, propane, natural gas and crude oil. Additionally, GLP acts like a broker and distributor of these fuels through its trading and retail marketing businesses. The wart on Global’s face happens to be its “virtual pipeline” of railway assets. GLP has expanded hard into the Bakken and features numerous railway tanker cars and terminal assets in the shale field. However, with crude oil dropping in price, production has flowed suit. That has left GLP in a bad place with regards to picking up extra earnings from the businesses. Longer-term, cost of production from the Bakken’s biggest players continues to drop, and that should make help GLP rebound. In the meantime, Global is more than making enough to pay its juicy 8.6% distribution. As of this writing, Aaron Levitt was long MPC. Article printed from InvestorPlace Media, https://investorplace.com/2015/08/5-solid-mlps-yields/.